PLEASE NOTE: We recommend that chunky style festival glitters are only used on children over the age of 12 and adults only as they are not really suitable for use on younger children. Anyone using these glitters on children under 12 does so at their own risk. 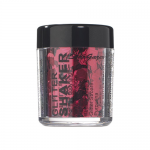 These glitters should not be applied directly to the eye or too close around the eye area. We will not be held responsible for any misuse.